Okay so maybe I'm using the term "recipe" in this post loosely. I mean after all, I'm not actually MAKING any of the ingredients, RIGHT!?! Well, its like this, most evenings you're super busy and just need dinner on the table fast. You have a fridge full of ingredients, but no ideas. 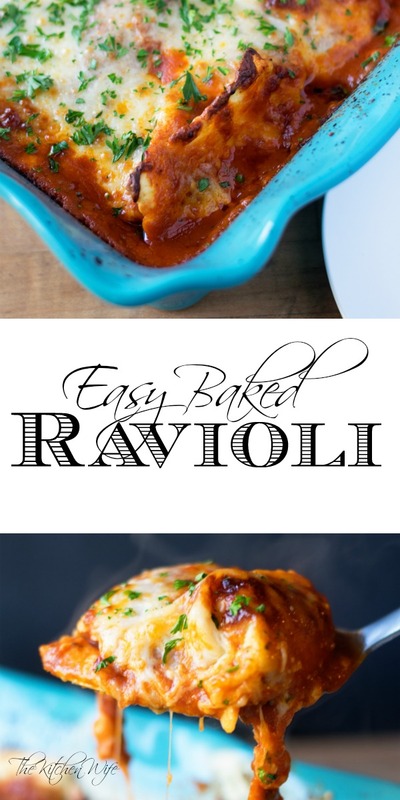 Sometimes you just need an idea and that's what this Easy Baked Ravioli Recipe is, a great idea. Before you start assembling your Easy Baked Ravioli, you will need to preheat the oven to 425 degrees. After that you will need to spray a baking dish with cooking spray. Next take a little of the pasta sauce and spread across the bottom of the baking dish. This helps to keep the pasta from sticking to the bottom of the dish. Now place HALF of the bag of ravioli on the bottom of the baking dish. Pour HALF of the pasta sauce over the ravioli. Top with HALF the mozzarella cheese and sprinkle some grated parmesan. Now place the rest of the frozen ravioli in the baking dish. Pour the rest of the sauce over the ravioli. Add a 1/4 c of water to the empty jar of pasta sauce and give it a nice shake. Pour the saucy water over the ravioli in the baking dish. Sprinkle the remaining mozzarella cheese on top and more grated parmesan as well. Cover with foil and bake in a 425 degree oven for 30 minutes. 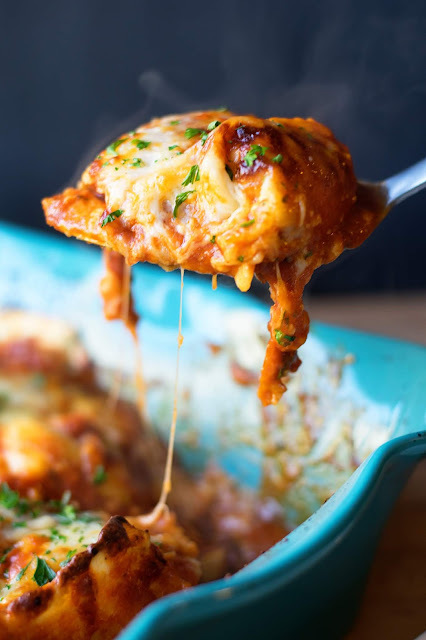 Once the 30 minutes is over, uncover the baking dish and return to the oven for another 15 minutes to allow the cheese to get bubbly and brown. And just like that, DINNER IS SERVED! 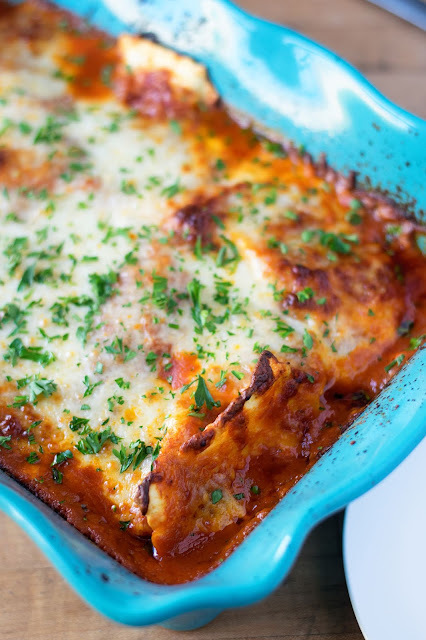 Look at how gorgeous this Easy Baked Ravioli looks! And in case you need future convincing just look at that cheesy goodness! And this is just the beginning of what you can do with this recipe. You can add vegetables, Italian sausage, chicken, the possibilities are endless! As for me I just served this up with a side of bagged salad and garlic toast! No matter how you serve it, this Easy Baked Ravioli Recipe really is the PERFECT weeknight meal for your busy lifestyle! I know you're gonna love this one, so get in the kitchen and make it TONIGHT! Spread a small amount of the pasta sauce on the bottom of the baking dish to prevent sticking as well. Place HALF the bag of frozen ravioli on the bottom of the baking dish. Pour HALF the jar of pasta sauce over the ravioli. Sprinkle HALF the mozzarella cheese over the baking dish along with some of the grated parmesan. Add the rest of the frozen ravioli to the baking dish. Add the water to the pasta sauce jar and give it a good shake. Pour the saucy water over the baking dish. Add the rest of the mozzarella over the top with a little more grated parmesan cheese. After 30 minutes uncover and bake for 15 more minutes to allow cheese to brown.